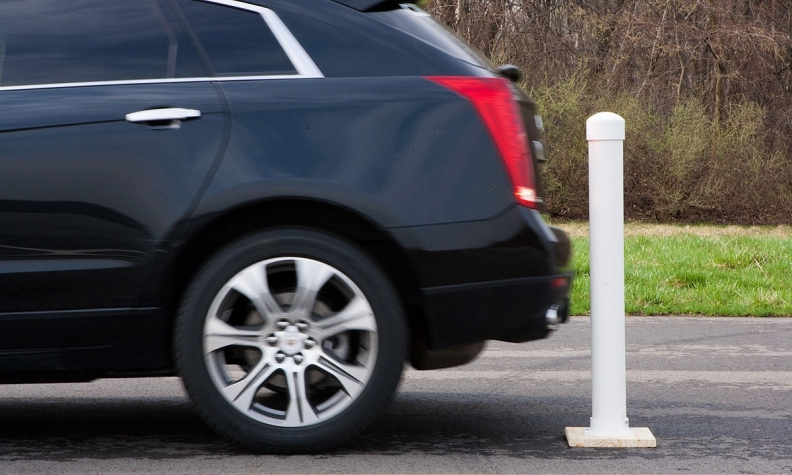 Cadillac's front and rear automatic braking performs like a “virtual bumper,” slamming on the brakes as a last resort to help drivers avoid crashes or contact with surrounding objects. Editor's note: An earlier version of this story misstated the number of model lines in which Fiat Chrysler offers automatic braking as optional equipment. Big automakers are rushing to launch self-driving cars as early as 2021, but the industry's major players are moving slowly when it comes to widespread deployment of a less expensive crash-prevention technology that regulators say could prevent thousands of deaths and injuries every year. Nissan Motor Co. said Thursday it would make automatic braking systems standard on an estimated 1 million 2018 model cars and light trucks sold in the United States, including high-volume models such as the Rogue and Rogue Sport compact crossovers, the Altima sedan, Murano and Pathfinder SUVs, LEAF electric car, Maxima sedan and Sentra small car. Nissan sold about 1.6 million vehicles in the United States last year. Rival Toyota Motor Corp. has said it will make so-called automatic emergency braking standard on nearly all its U.S. models by the end of this year. Overall, however, most automakers are not rushing to make automatic brake systems part of the base cost of mainstream vehicles sold in the competitive U.S. market. The industry has come under pressure from regulators, lawmakers and safety advocates to adopt the technology, which can slow or stop a vehicle even if the driver fails to act. So far, only about 17 percent of models tested by the Insurance Institute for Highway Safety offered standard collision-avoiding braking, according to data supplied by the auto safety research group backed insurance industry. Many of the models with standard collision-avoiding brake systems are luxury vehicles made by European or Japanese manufacturers. The systems require more sensors and software than conventional brakes, and automakers said they need time to engineer the systems into vehicles as part of more comprehensive makeovers. Last year, 20 automakers reached a voluntary agreement with U.S. auto safety regulators to make collision-avoiding braking systems standard equipment by 2022. Safety advocates have petitioned the National Highway Traffic Safety Administration to begin a regulatory process to require the technologies, but the agency has said the voluntary agreement will result in faster deployment than a formal rule-making process. NHTSA says the technology could eliminate one-fifth of crashes. "Do the math. That’s 5 million crashes every year -- 20 percent reduction means 1 million less. Those are big numbers," Mark Rosekind, the NHTSA's then-administrator, told Reuters last year. But customers would likely experience the benefits of the technology infrequently. The technology to enable a car to drive itself is far more costly, but industry executives foresee autonomous vehicles driving revenue-generating transportation services that could be attractive to investors. General Motors offers automatic braking as optional equipment on about two-thirds of its models. The company did not say on Thursday how many vehicles have the technology as standard equipment. GM has not made public its plans to make the technology standard across its lineup. "Any time you have a voluntary agreement you have a spectrum of implementation," Jeff Boyer, GM's vice president for safety, told Reuters earlier this week. Asked when GM would roll out standard automatic braking, Boyer said, "let's just say we honor the voluntary commitment." Ford Motor Co. "has a plan to standardize over time," the company said in a statement on Thursday. Currently, automatic braking systems are optional on several 2017 Ford and Lincoln models, and will be offered on certain 2018 models including the best-selling F-150 pickup truck. Fiat Chrysler Automobiles offers automatic braking as optional equipment in nine model lines, using cameras and radar to detect hazards ahead. The company has said it will meet the 2022 target for making the systems standard. As 2018 models roll out during the second half of this year, more vehicles will offer automatic braking, said Dean McConnell, an executive with Continental's North American business. Continental's automatic braking technology systems will be on certain Nissan models. "We see it accelerating," he said. "It varies. There are some (automakers) that are being aggressive" and others that are waiting. Nissan did not disclose how much prices for vehicles would rise to offset the cost of standard automatic emergency braking. The 2018 models will be launched later this year. Currently, Nissan, like most automakers, offers automatic braking as part of a bundle of optional safety and technology features. A 2017 Nissan Sentra compact sedan has a starting price of $17,875. To buy the car equipped with automatic braking requires spending another $6,820 for a Sentra SR with a premium technology package. German auto technology suppliers Continental and Robert Bosch will supply the systems, Nissan said.